Are you like me? Do you start each New Year with a set of resolutions that you spend the next twelve months failing to keep? What are we thinking when we vow to drink less, exercise more, or shed thirty, thirteen, or three pounds? Could we make ourselves climb a mountain that is any higher? 1. Appreciate those with opinions that 1. Avoid idiots. week. the second to the first floor. 4. Embrace aging. 4. Dye hair monthly. 5. Swim twice a week. 5. Drink more water. 6. Complete writing your opus. 6. Invest in a shredder. 7. Learn a new language. 7. Learn proper use of the semicolon. 8. Run the New York City 8. Walk more in Central Park. humiliating antics. more humiliating antics. 10. Be a better person. 10. See number 1. This entry was posted in holiday, Humor and tagged new year's, new year's resolutions, resolutions. Bookmark the permalink. Number 3 is my favorite, too, Kathy! Happy New Year to you and Sara! 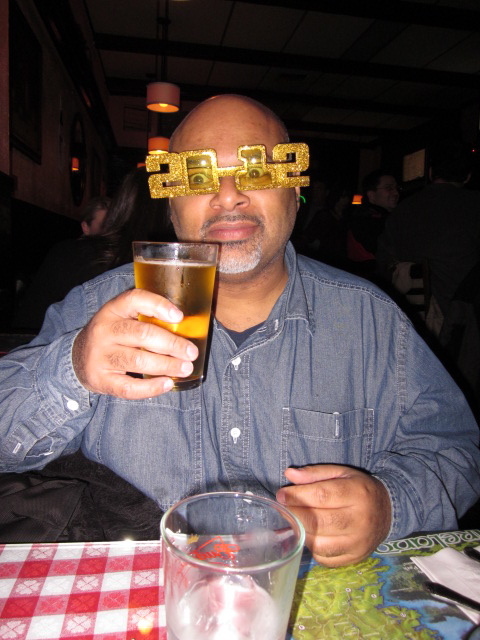 The best New Year’s Eve blog ever, ever, ever! I love number 1 and #10. Sounds like the perfect way to sail through 2012. Oh, you are so wise and helpful. Why didn’t I come to you before I wrote my self-pitying post today! I admire your sense of humor so much, girl! Gee, I’m so glad to have entertained you, SDS. I just get so fed up with all the New Year’s pressure. It’s really just one day segueing into another — except with a crowd the size of a city in Times Square and an epic cleanup afterward. If you’re trying to avoid idiots does that mean we can’t hang out anymore? If we don’t hang out anymore who am I going to see this with?